More and more top pilots are posting cinematically edited long range FPV videos of mountain dives, flying across rivers or sweeping over villages. The sense of exploration in these videos is truly amazing, and reminds me of what got me interested in FPV in the beginning, to explore! Quite frankly these footage inspires many to jump aboard the hype train, though the technical aspects of long range flying can be daunting for some. In this article I will share some tips to help you fly long range more safely and confidently. Don’t push your limit the very first time. Take multiple attempts, and fly a little further every time. This allows you to understand your drone’s capability better in the given environment, and it minimizes the chance of losing your quad. The most important thing about flying long range is to keep your mini quad in line of sight at all time. Obstacles can easily disrupt your video and radio signals, and high frequencies such as 2.4GHz and 5.8GHz are known to have bad object penetration ability. The easy thing to do is to keep your altitude. Unless you know what you are doing, avoid anything risky like going to the other side of the mountains, or flying under tree line etc. Before taking off, make sure to carefully inspect the environment for any possible bind spots that could block your signals. Simulate and plan the flight path in your head that allows your quadcopter to maintain line of sight during flight. Look for visual markers on the ground, so you are less likely to lose orientation and know roughly where you are. What’s the range of our 2.4GHz radios? From my experience, in the most optimal conditions, many popular 2.4GHz radios are able to give you up to 1 mile of range (about 1.6Km). For example, the Frsky Taranis with X4R-SB, and Spektrum DX8 with SPM4649T. However if you want more range, or simply better reliability and confidence, you should consider upgrading your radio to a long range one. There are currently two popular options that utilize the 900MHz band, TBS Crossfire and Frsky R9M. These modules simply plug into the back of your Taranis module bay, making the upgrade super straightforward. 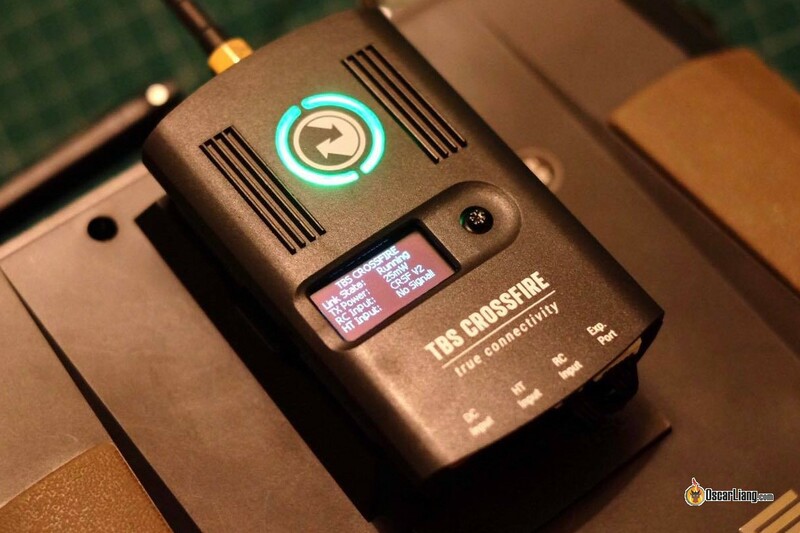 Crossfire is more mainstream and supports up to 2W with their full size module. But the frsky R9M system is a much more economic option with a maximum power of 1W. However if you find yourself needing any higher power than 1W, it tells me that you are either flying in a very noisy environment or you are flying really far away, in which case you might be better off to use lower frequency such as 433MHz. On the video receiver side, try to use a diversity receiver module on your FPV Goggles, and a high gain directional antenna. Some expensive receiver modules don’t necessarily perform better for long range, for example the Clearview and Rapidfire. These are designed mainly for indoor or noisy environment and don’t have a clear advantage over other diversity modules when it comes to long range. My favourite at the moment is the Eachine Pro58 with Achilles firmware. Here are my FPV antennas Recommendations. If you are allowed to use lower frequency for video transmitter, e.g. 2.4GHz or 1.3GHz, this would be a better option. Check out our review of the TBS Ground Station. The downsides are it’s not always legal, and you won’t be able to use 2.4GHz for your radio and fly with anyone with 2.4GHz radio. Efficiency of a multirotor is closely related to battery, Motor, Props and Frame. Simply using a larger battery to gain flight time doesn’t always work, as discussed in this article. Not only your quadcopter becomes slower due to the heavier weight, it also requires more power to stay in the air so you might not get as much flight time increase as you expect. Efficiency is way more important when it comes to long range FPV flying. For a 5″ mini quad, you can make it more efficient by simply using a less aggressive motor and propeller combination (lower KV and lower pitch). Try to build it as light as you can, and remove all the unnecessary parts to keep the weight down. Every gram you save is a few extra seconds in the air. With such build you can carry a bigger battery such as 2200mAh or even 3000mAh. However don’t expect the same agility as you would normally get on a 5″ build. When it comes to the frame design, durability is less important as you don’t plan to crash often. Being light weight and streamline is more important for long range. 6″ is becoming widely used for long range as well because it’s a great balance between agility and flight time of 5″ and 7″. Higher voltages LiPo batteries such as 5S or 6S are also a great direction to consider for better efficiency, especially for cruising flights. Make sure you have enough battery to make your way back. This is the biggest error pilots tend to make when flying long range. Take wind speed and direction into account as well, if you are flying back with headwind it will drain your battery much quicker. That brings us to another point, never fly when it’s “too windy”, especially when the wind is strong enough to push your quad around. My general rule of thumb is using 40% of capacity for outbound flight, and the rest for inbound. This gives you 20% margin of error just in case. For example, if you are using a 2000mAh battery, you should turn back as soon as you’ve consumed 800mAh. If you are flying down a mountain or hill, you should also reserve extra capacity to fly back up. If your FPV goggles has onboard DVR, use it for every flight. If it doesn’t, get an external DVR. In case you crash, you can review the DVR footage and find out where about you crashed. This will save you time searching for the model blindly. You cannot hear your quad from far away. Some people prefer to hear the motors spinning and the buzzer beeping. This give them confident what’s going on with the quad, and feeling more connected. However it’s not for everyone because the audio coming from a quad can be really noisy and annoying. This guide explains how to setup audio for FPV. You absolutely should get GPS for long range, GPS rescue mode in Betaflight can bring your quad back to you when signals are lost. If you unfortunately crashed and had to search for your quad, knowing your GPS coordinate and having a loud buzzer installed can help tremendously. Especially a buzzer with its own battery. Buzzers with built-in battery can continue to beep for hours even days when the battery is unplugged. Is Long Range FPV Flying Legal in your Country? I hate to bring this up, but I don’t want to encourage anyone to do something that might be illegal. Some countries have more strict rules than others on how far you are allowed to fly with a drone in FPV, and what the maximum output power you are allowed to use on the VTX. I know as a fact that FPV is even banned entirely in some countries. Please follow the regulations and fly sensibly, do not put yourself or others at risk. I hope this article was helpful, let me know if you have any question or comments. Really you are the best. thank for all. What Amp ESCS do you use for the t motor 1700kv and 7″ props? What about the combination of 7” prop (low pitch – 7040), high kv motors (around 2600kv) and 3s battery. ESC is rated for cont 45A. Idea is to use bigger 3s (2200mAh – 3000mAh). I know this is not the traditional way to go, but do you think it would be possible to get a good efficiency from this kind of setup? I have 7inch extended arms ZMR now with 2206 1900KV motors and 7×2 carbon (only 20pitch) props can I go to 4S? only tested with 3S and betaflight 3.5.0… motors were just warm and 40% was hover throttle without actioncamera. If your flight controller, ESC’s, PDB etc are rated to 4S then you should be fine. Hello, What you think is better…? 2207 or 2306 motor for smooth flying…. cruising over the forest and mountain at below 60% throttle? I am looking for the best effiency motor for my 7″ on 4s .. and wich KV is the best…? I actually use tbs endurance and I found the bearing is cheap… so I want to give a try to another brand. Thanks Oscar, this will come in handy as I’m considering building a long range craft. The racecraft 6″ props are amazing as well. Running them on my stringy = a blast mountain surfing. Thanks for pointing out the legal requirements! This topic is often not discussed in quadcopter related posts and videos. Keep on bringing your great articles.